A Bruiser 112 armoured personnel carrier. Bruisertech is relatively unique amongst the world’s armoured vehicle manufacturers in that it is building vehicles on stock that will be available for immediate purchase by potential customers. 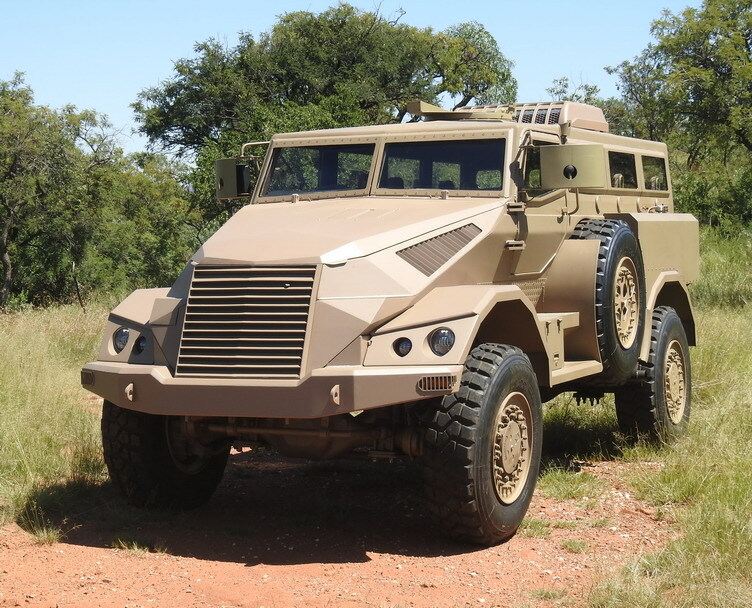 The company launched its privately developed Bruiser 112 armoured personnel carrier (APC) at the Africa Aerospace and Defence exhibition outside Pretoria last year and launched production in the first quarter of this year. An initial ten vehicles are being built for stock, which Bruisertech says helps differentiate it from competitors and makes its vehicle more attractive to customers as the vehicles can be delivered immediately. In conflict situations, it is undesirable for customers to wait for months for new vehicles to be manufactured and they often have to rely on second hand vehicles – in many instances it takes a year before a signature is placed and another year before delivery. Bruisertech will have at least ten vehicles on stock, but if a customer wants additional Bruiser 112 vehicles, they can be produced in around three months. The build-for-stock model is not a new concept, and has been applied successfully by companies like Damen, which builds in-demand vessels before orders are placed, ensuring significantly shorter delivery times. Bruisertech has designed the Bruiser 112 for the African market where a cost effective, reliable vehicle is needed. The company has found that the more sophisticated vehicles built in places like the United States come with features that are not needed in Africa and can be difficult to service and maintain. The baseline Bruiser 112 is an efficient and rugged vehicle but it can be modified and upgraded according to customer requirements – for instance, bolt-on armour is an option as are ABS brakes, a central tyre inflation system, run flat inserts, radios, intercom, public address system, weapons stations and long-range fuel tank. The vehicle can carry a crew of two plus ten equipped personnel. Kerb weight is 8 500 kg and payload 4 500 kg. The armoured hull provides blast protection to STANAG level 3A/3B. Ballistic protection is to STANAG level 1 but can be upgraded. The vehicle is powered by a six-cylinder turbodiesel MWM engine coupled to an automatic transmission, giving a top speed of up to 120 km/h and range of 1 000 km. The Bruiser 112 is designed to meet different customer requirements and can be configured in either left or right hand drive through a simple bolt-on system, allowing it to compete in any world market. Different roles can be carried out by the Bruiser 112 – a snow plough or grader or improvised explosive device (IED) system could be installed or it could be configured as a recovery vehicle, ambulance, or weapons carrier.